The Rockies are looking to bring a World Series Title to the Mile High city. In a highly contested Western Division, Colorado will need to beat out the San Francisco Giants and the Los Angeles Dodgers. With budding young talent, the future looks bright in Colorado. Grab your 2018 Colorado Rockies tickets and head over to beautiful Coors Field and cheer on your team in their pursuit of a World Series trophy. The 2017 MLB season was been a bit of a rollercoaster ride for the Colorado Rockies. They lost to the Tigers on August 30, 2017, by a score of 6-2 which means that they ended August with a 12-15 record. That is a far cry from June 20, 2017, when they had recorded a season high of 21 games above the .500 mark. From that point onwards, the Rockies posted a 25-35 record which put them at the bottom of the NL West during that period. The Rockies made it to the playoffs for the first time since 2009 last season. They clinched the second Wild Card spot in the National League but unfortunately lost to the Arizona Diamondbacks in the Wild Card game. Will the Rockies make it further this year in the playoffs? Book your 2018 Colorado Rockies tickets to find out. The Rockies might not have won any World Series titles to date but they have still given their fans plenty to cheer about. Here are a few of those. The 2007 Run to the World Series - 2007 was a very special season for the Colorado Rockies and their fans. The Rockies were brilliant in the last stretch of the regular season as they won twenty of the last twenty one games to romp through to the playoffs for the first time since 1995. They were up against the Phillies in the NLDS and the Rockies beat them 3-0. The Diamondbacks were up next and they were trounced 4-0. The Rockies found themselves in the World Series against the formidable Boston Red Sox. Their run ended there as they lost 4-0 to the team from Boston but it was still a season that every Rockies fan will remember forever. First Trip to the Playoffs - The date was October 1, 1995, and at the Coors Field, the Colorado Rockies were up against the San Francisco Giants in a crucial encounter. The game turned out to be a high scoring affair and the Rockies edged the Giants 10-9 in the end to earn a wild card berth and make it to their first ever playoffs. By doing so, they also became the first expansion side in MLB history to qualify for the postseason before its eighth season. Rockies-Giants Rivalry - The Colorado Rockies and the San Francisco Giants are poles apart when it comes to the number of titles both sides have won. Regardless, there is a still a lot of heat between these two sides. There are a number of reasons for the Rockies fans to dislike the Giants and one of them is the Giants famous World Series winning streak in even numbered years. Then there is Buster Posey who has a special liking for the Rockies players and almost always delivers against them. Rockies-Dodgers Rivalry - Every time the Colorado Rockies take on the Los Angeles Dodgers, it seems that something will happen. If one had to trace the roots of this rivalry, they would have to go back to 1993 when the two sides met on June 15, 1993. Andres Galarraga was brushed back by Ramon Martinez of the Dodgers. Galarraga got a walk but Martinez hit him with a wayward throw at first base. The fuse was lit. Galarraga then tried to steal second base and with his legs high slid into base and caught Jody Reed with his spikes. Martinez then answered by hitting Charlie Hayes of the Rockies when he came to bat next. Hayes then ran towards Martinez and both players were ejected. It however did not end there. Just an inning later, Mike Piazza of the Dodgers hit his second HR. Then came Cory Snyder to bat who was hit by Keith Shepherd’s pitch. A brawl, that saw the Dodgers run on to the field, ensued. Things have just not been the same between these two sides since. As soon as Coors Field opened, it seemed like pitchers couldn't keep the ball in the park. Coors Field is one of the best ballparks in the nation for fans to get an opportunity to catch a home-run ball. At the Blue Moon Brewery at The Sandlot, fans can enjoy beers that have been creatively crafted just for Rockies games. Families can also enjoy the center field decorations that consists of a waterfall, fountains, and pine trees. Make sure to try some Rocky Mountain Oysters at the ball park. The Coors Field is famous for hosting major sports and entertainment events. It played host to the MLB All-Star Game in 1998. It was also the venue for the Game 3 and Game 4 during the World Series in 2007. The Coors Field also played host to a couple of outdoor ice hockey games in 2016. Todd Helton is arguably the greatest Colorado Rockies player of all time. He was a five time All-Star, won the Silver Slugger gong on four occasions and also clinched three Gold Glove Awards. The Rockies have retired his number 17. Carlos Gonzalez won three All-Stars selections, won three Gold Glove Awards and was declared the National League Batting Champion in 2010. Larry Walker played for the Rockies between 1995 and 2004. He became a five time All-Star with the Rockies and also won the NL MVP Award in 1997. Not only that, but he also won all seven of his Gold Glove Awards till date in Colorado. Will the Rockies Make an Impact This Season? The Colorado Rockies will be keen to make it to their first postseason since 2009. They have the talent to do that but will need the full backing of their fans. If you are a fan, then check the schedule and book your Colorado Rockies baseball tickets. The current MLB season is in full swing and this is your chance to help your side rediscover its form. Our process for purchasing cheap Colorado Rockies tickets is simple and fast. There are so many online ticketing sites, that it can be hard for customers to find the right place to buy Colorado Rockies tickets at the cheapest price. At ScoreBig we think of our customers first and foremost. We offer daily deals for Colorado Rockies events, so our customers can get the best seats for the best prices. ScoreBig will always go above and beyond to offer the cheapest Colorado Rockies tickets on the market. The Colorado Rockies schedule above, displays all available events for 2019 and 2020. Once you find the event that you would like to go to, click the red “Get Tickets” button. It is located on the right-hand side of the event listing, it will take you to an Colorado Rockies event ticket page. ScoreBig's event ticket page will display all available Colorado Rockies tickets for that event. On the event ticket page to help with your search for the right Colorado Rockies tickets, use the filters at the top to select quantity, price range, and more. There is also an interactive seating chart so you can pick where you want to sit. When you are ready to buy a ticket, click on the listing, and you will be directed to ScoreBig's checkout page. Upon completion of the information fields, your order will be processed and your Colorado Rockies tickets will be delivered via email, mail, or to your mobile device. What makes ScoreBig’s site stand out from the rest? We are constantly analyzing our competitors to improve our site, service, and prices. ScoreBig.com employees strive to offer the best process and experience to buy cheap Colorado Rockies tickets. Our goal is to get you the best seats to Colorado Rockies events. We offer daily discounts on our site and for special promotions check out our newsletter. If there are no Colorado Rockies events currently available, you can use our search feature at the top of the page to see a list of all popular events going on near you. No matter your price point, we have all the best deals and discounts on Colorado Rockies tickets. For more information on prices of Colorado Rockies tickets and the schedule for Colorado Rockies, check out our listings above. The last thing you want to find out is when the Colorado Rockies event you wanted to go to is sold-out. Don’t worry in many cases ScoreBig has affordable tickets to sold out events. We sell tickets from GA all the way to premium seating and parking. Skip the scalpers in the parking lot and get your tickets online from top Colorado Rockies ticket brokers. We get you in all events, buy your Colorado Rockies tickets here from a brand that many trust and rely on for all their ticketing needs. ScoreBig offers a 100% money-back guarantee. If you have been in search of cheap tickets for Colorado Rockies, ScoreBig by far is the best option. That’s why ScoreBig has more loyal customers than any other ticketing site. 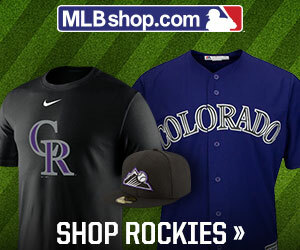 Shop at ScoreBig for safe and secure Colorado Rockies event tickets.